Creators and critics alike have a peculiar tendency to place works of art in a position of posteriority. The avant-garde seemingly no longer exists, replaced by endless posts: postmodern, posthuman, post-rock, and now according to Grimes aka Claire Boucher, post-internet: “The music of my childhood was really diverse because I had access to everything, so the music I make is sort of schizophrenic. Basically, I'm really impressionable and have no sense of consistency in anything I do." It’s a recurrent critique of so much music now that the range of influence is virtually infinite, turning artists into curators and compilers rather than creators of anything with even a hint of originality (a term that has lost any kind of critical currency). This can result in an amorphous mess, with the music itself adrift and without focus, unable to decide what it is and who it’s for. When it works however, the result can be dizzying and thrilling, a kaleidoscopic joyride through a time-tunnel, musical styles swirling and eddying. 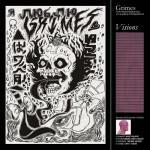 Grimes is a prime example of this post-everything maximalism, the press release for Visions claiming influence from Enya, TLC, Aphex Twin, New Jack Swing, IDM, glitch and New Age (among others). Fortunately she is talented enough to pull this disparateness together to form a cohesive, erm… vision that works on a musical and conceptual level. If we are, as has been theorised, all cyborgs now – irretrievably plugged in to the globalised digital matrix – then Grimes is a cyborg-pop princess, a kind of Lady Robo-Gaga. But instead of Gaga’s in-your-face bombast, we have a more delicate kind of thunder: a Bjork-like wondrousness and naiveté where the human, fragile voice of Boucher (often singing in a falsetto) rubs against the hard, glitchy, shiny surfaces of her synth-pop. This dialogue between the two states of being produces a thrill in the listener, a third state – a cyborg state – neither human nor robot. Others have attempted this melding before of course - Bjork being one, more recently Feist and St Vincent – but few have been as genuinely affecting. Visions works as an album as a whole, its constituent parts flowing on from and into each other to form a unified whole. This approach is rare these days, as the death knell for the long player has been sounded on many occasions. Individual highlights are hard to pick out, but Genesis and Oblivion are both perfectly formed pop songs, grooving away hand in hand – or groin to groin - with alien textures and strange effects. There is a recurring theme of physicality, or more accurately corporeality here, as evidenced by some of the song titles: Visiting Statue, Be A Body, Skin. These are the songs that Pris from Blade Runner would listen to, full of longing – longing to be touched, to be human, to be loved. This duality reminds me of Maxinquaye, another album that mined the seam between the body and technology, although Visions isn't quite as startling as Tricky’s pre-millennial masterpiece of psycho-sexual anxiety. This album has the feeling of a breakthrough of sorts. Grimes has operated hitherto on the margins, but with her signing to 4AD she seems to have reached a point of definition in her music. Visions is beautifully conceived and executed, musically, lyrically and thematically. It draws you in to its alien (third) space. Intimate, sensual synth-pop is a hard trick to pull off, but here it is. Forget meaningless labels like witch-house or chillwave, this is just great pop music. It’s a grower, but once its charms have inveigled your consciousness like a virus, they will not easily be shaken. Get into this before it’s repackaged and resold as something new by a mainstream industry desperate for novelty.